Many residents of Los Angeles, hurt by trip and fall accidents, have turned to David to obtain just compensation from negligent corporations and other parties. The Law Firm of David Azizi has a 98-percent success rate and offers a free, no-obligation case review. If you’ve tripped, fallen and been hurt because another party acted irresponsibly, call the Law Offices of David Azizi at (800) 991-5292 any time of the day or night. Uplifted pavement and sidewalks are trip and fall hazards. Falls from the same level cost $7.94 billion annually, according to the National Safety Council. Falls are the third leading cause of accidental death right behind motor vehicle accidents. Safety Facts published data that shows 32,000 individuals died from falls of all kinds in 2016. Six hundred people died due to workplace falls and 47,000 were injured. Consider that 12-15 percent of these are slips, trips and falls, and you realize that such accidents cause great physical and financial harm. What Should You Do If You Suffer a Trip and Fall Accident? * Ask to see the manager/owner or person in control of the property if you were injured on the premises. When the manager arrives, ask for his or her name and ID number. Ask to fill out an incident report if it is not offered automatically. Obtain a copy. *On private property, obtain the homeowner’s information if you tripped over a misplaced garden hose or a walkway that is damaged. If the person rents the property, you might want to contact the rental office or the owner. *If you tripped on a city sidewalk uplifted by tree roots or otherwise damaged, you can file a trip and fall claim with the county of Los Angeles. Your attorney can advise you about taking this step. *Take a picture of the circumstances that caused you to trip and fall. If possible, measure the box, sidewalk, barrier, rise or tree roots that caused the accident. It is important to measure it before the problem is fixed. *If you notice that anyone witnessed the accident, ask for contact information such as their name and telephone number. In addition, even if someone did not see the accident happen, they might be aware of the injury you suffered or be aware that the dangerous condition existed before you fell and may even have told someone in authority about it. *If the accident occurs in an area with a video camera that captured the incident, take note of it. You might even take a picture of the placement of the video camera. If the accident happened in a part of the store without a video camera in direct sight, look around. A different camera might capture an employee checking the area. Conversely, it might show the employee did not do a scheduled inspection where you fell. *If the accident happened outdoors, you may want to canvas the area to see if businesses or city video cameras captured your fall. Ask shopkeepers or the city if you can have a copy of the footage showing the incident. This may be valuable evidence to support your case. *If you can, go to a doctor for an evaluation or visit the emergency room. Many injuries are not obvious right away. Tell your doctor you were in an accident, and ask for a copy of his or her notes. Follow the instructions your doctor recommends. *When you arrive home, take a picture of any bruises or abrasions that are visible. *Write down everything you can remember about the accident. *Begin a diary of how you feel each day if you are injured. *Keep all receipts for medical expenses such as doctor bills, travel expenses to and from the doctor and prescription receipts. *Preserve any physical evidence of the accident such as the clothes and shoes you had on. The Legal Standard of Proof in Trip and Fall Claims Is it a Crime? The law in California is clear: individuals/entities who own or are in control or possession of a property are required to remove dangerous hazards from the premises to ensure the safety of visitors, or warn them that the danger exists. The owner/person in control/renter must inspect the premises on a regular, frequent basis to assure that dangerous conditions do not exist. The injured person in a trip and fall case must prove that the property owner/tenant failed to take reasonable steps to ensure their safety. In short, the property owner or person in control of the property left what he or she knew to be a dangerous condition on the property that could cause the visitor to trip and fall, resulting in injury. If that happens, the entity may be considered negligent and liable for the financial loss caused by the victim’s injuries. Examples of hazards might be tree roots, crumbled sidewalks or boxes/pallets placed in walkways. *The property owner, as any reasonable person would, should have been aware of the dangerous condition or should have known about it. This is accomplished with regular, reasonable inspections. The frequency is dependent on the type of property. For instance, grocery store premises are inspected every 30 minutes to one hour. *The property owner knew about it but failed to fix or remove it. *The property owner caused the condition. How Long Does It Take to Resolve Trip and Fall Cases? The actual time it takes to resolve a trip and fall case varies. This is dependent on whether the insurer is willing to provide a reasonable settlement or if the case must proceed to court to be decided by a group of your peers. Your attorney will negotiate with the insurance company for you. When you settle a case, the insurance company will ask you to sign a waiver saying that you will not hold them liable for anything related to the case. Literally, what is you receive is all you will obtain even if subsequent problems develop. If negotiations falter, the case can proceed to court. Again, the exact time it will take to be resolved varies. Medical expenses: This is the amount you pay for hospital costs, doctor bills, medication and rehabilitative therapy. There may be other costs as well such as home medical equipment or nursing visits. Future medical bills related to the accident are also included. Lost Wages: This will include what you could have earned at work had you not been in the accident. If you can’t return to the job you held prior to the accident, you might be eligible to collect lost earning capacity. Pain and Suffering: This varies from person to person and includes mental anguish or emotional distress such as anxiety, depression, insomnia and irritability. It also includes chronic pain. The liable party may have insurance that covers trip and fall injuries. The insurance company investigator will ask to talk to you in person or over the phone. He or she may ask for your medical records and needs your authorization to procure them. Often, the insurer will ask for your complete medical records in an effort to see if you were suffering from the same complaints you are saying were caused by the accident. They will also check to see if there have been prior claims for personal injury. If you are representing yourself, you will need to make sure the necessary information is provided to the investigator. However, if an attorney is representing you, he or she can be a liaison between you and the insurance company. The attorney would deal with the insurer and protect your interests at the same time. The insurance company will calculate what the case is worth and make an offer. This offer can be negotiated by your attorney. However, if the insurer is not willing to offer the reasonable compensation you deserve, you may need to file a lawsuit, and go to court so a jury of your peers can determine the amount of damages you should receive for your injury. Attorneys are often asked how much is my case worth. That varies from one case to another. To provide you with an estimate, the Law Offices of David Azizi offer a trip and fall settlement calculator. David will review the results during your free case evaluation and give you your options and possible settlement/verdict amount. The injuries you suffer in a trip and fall accident are often severe due to the lack of protection you have in this situation. In addition, it may not be possible to break your fall. Shoulder injuries, including brachial plexus injury or nerve impingement resulting in impaired use of the arm and hand. Injury to the cervical/neck region resulting in herniation or disc bulging. Traumatic injury can also aggravate a preexisting condition such as degenerative arthritis, which is common and may be totally asymptomatic.The trauma of the fall can cause the condition to become symptomatic, leaving the individual with a chronically painful cervical area. Injury to the thoracic/mid-back area of the spine, including injury to the vertebral discs. Just as in the cervical spine, the trauma may aggravate a preexisting condition that was previously asymptomatic. Low back or lumbar spine injury, consisting of tendon, ligament or disc injury with possible exacerbation of an asymptomatic pre-existing condition. Knee injury such as a partial or total meniscal tear can occur, particularly the medial and lateral ligaments. Hand and wrist injury, particularly when the individual falls forward. 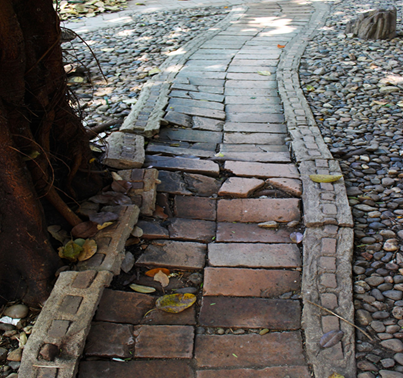 Crumbled pathways can lead to trip and fall accidents. 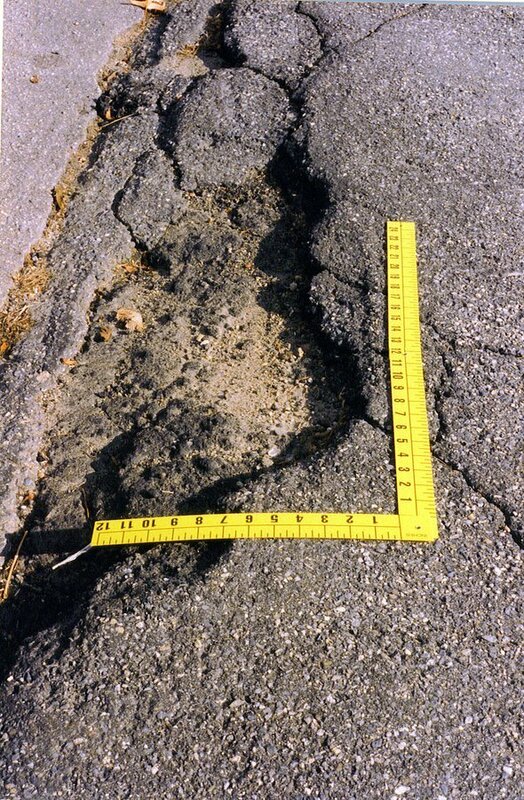 Sidewalk defects: Trip and fall accidents commonly happen when sidewalks are broken or have an offset, rise or displacement of the sidewalk. Tree roots can cause a portion of the sidewalk to be uplifted and are the most common reason sidewalks are damaged. Exposed tree roots can also cause someone to trip. Changes in height of steps, sidewalks or floors: This can happen due to a variety of reasons, including settling, construction defects or tilting over time. See our steps and ramps page. Poor lighting or lack of lighting in combination with a trip hazard: This makes it difficult to see items or steps directly in front of you. All areas where individuals walk should be clearly lit to avoid a trip hazard. Rugs/mats that are bunched or torn carpet: Incorrectly laid or maintained carpets or rugs can create a fall hazard. Electrical cords: Loose electrical cords can create a cable trip hazard. David Azizi reviews accident with client. Trip and fall, like slip and fall, is under the premises liability umbrella. However, they are not the same. David Azizi practices only personal injury law and has won many slip and fall as well as trip and fall cases. He is the attorney you should turn to if you have experienced a trip and fall accident. Call him at (800) 991-5292 24/7, and set up a free, no-obligation case review. Expertise.com said David was a top personal injury lawyer in Los Angeles. Super Lawyers called David one of the best trip and fall lawyers in Beverly Hills. Make no mistake, this is not easily won. Rather, it points to the standing the Law Offices of David Azizi has in the community. When you’ve been hurt, call us anytime, seven days a week. Learn your options and get David’s opinion of your case. David has won 98 percent of his cases. Let yours be one of that number today.